Traditional handpainted target game with colourful bean bags. 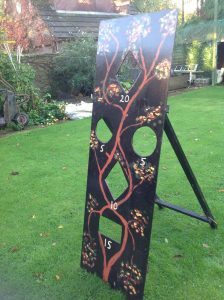 Large freestanding target board to throw the bean bags through. Ideal for all age ranges. Handpainted tree design with scores. This is a large game which needs a good sized family vehicle for transportation.